In the year 2046, it’s a new Earth – with new rules. Over thirty years after various alien races arrived on Earth, the landscape is completely altered, terraformed nearly beyond recognition. 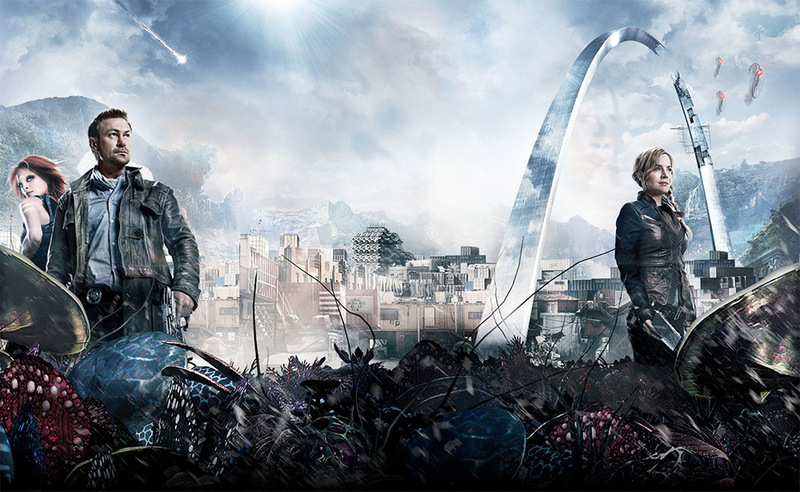 To the town of Defiance, on what used to be St. Louis, comes the mysterious Nolan (Grant Bowler) and his charge, Irisa (Stephanie Leonidas). As they settle into town – overseen by the mayor, Amanda Rosewater (Julie Benz) and filled with residents like the powerful Rafe McCawley (Graham Greene), enterprising lounge owner Kenya (Mia Kirshner) and the ambitious, alien Tarrs (Tony Curran and Jaime Murray) - events begin to unfold that threaten the fragile peace this border town has fought for. As the events of Defiance unfold weekly on your TV screen, you can see how the residents’ struggles impact the game of Defiance, a high-octane, multi-platform experience from Trion Worlds! For the first time in history, a TV show and a game will exist concurrently in a shared universe, influencing and impacting the other! In the game of Defiance, players take on the role of Ark Hunters, specialists in survival, combat and tracking who brave dangerous frontiers to retrieve lost relics of advanced or alien origin in return for great financial rewards (The Arks are the ships that brought the aliens to Earth). Players can search for Arks on their own, simultaneously join tens of thousands of other players for missions or just explore the fully realized, future world of Defiance (it's really, really big). Custom character creation allows players to adopt a human or alien appearance for their Ark Hunter. With weapons, armor and special abilities that evolve with experience, Defiance is a gaming experience that must be played to be believed. What's it about?! *reads description* Oh! I'll check it out when I get home. It'll be good. I'm really looking forward to this series. I need more scifi series.